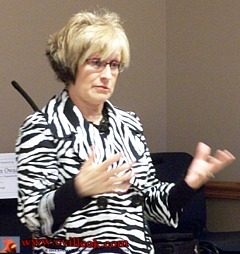 Pam Webb stressed the importance of the impression made in the first 30 seconds of a customer entering a store. A longer term rekationship is also important but best to start on a good impression. She asked Collinsville merchants to take a look at their customer service habits as one of the ways we can all help in the "Shop Collinsville First" campaign. Pam cited a bit of "Collinsville experience" with her grandmother graduating from CHS in 1917, her dad in 1950, she in 1973 and then her own kids. She also cited a long list of jobs in Collinsville, most recently her new endeavor with Three Sisters catering, 16 years with the school system, Webbcraft boat manufacturing, and several other area jobs. Pam was Chamber President in 1999. 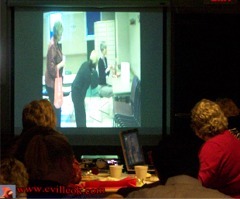 Pam presented a video showing some good and bad example of merchant / customer interfacing with some local video talent.